What would the winter holiday’s be without the aroma of chocolate peppermint wafting through the air? The classic flavor combination originated prior to the early 1900’s. 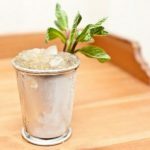 Restaurants and coffee houses used to serve mint spring leaves and dark chocolate at the end of meals. Mint helps cleanse the palette and together the ingredients aid in digestion. When I crave the taste of Girl Scout Thin Mints, while sticking to a raw diet, I blend a this Chocolate Peppermint Green Smoothie. During the festive season, I use beets not so much for flavor, but for the red color they impart. 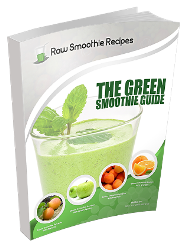 These tasty frozen blended raw green smoothies are power packed with nutrients. 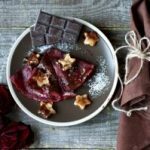 Is Chocolate Really a Superfood?! When I heard that chocolate is a Superfood, I was suspicious. As it turns out, only raw cacao, the bean chocolate is made from, bears the nutrient rich properties that deem it a Superfood. Raw cacao is the basis for traditional chocolate, but is unprocessed (never heated above 45 degrees.) The biggest complaint many people have about raw chocolate is the taste. Raw chocolate is bitter, yet in a deliciously mellow way. Fans of dark chocolate tend to love cacao because its a similar flavor palette. Chocolate Can be Healthy Too! 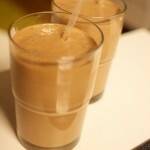 Initially, adding raw chocolate to my diet or raw green smoothies sounded too indulgent. I was a little apprehensive about the veracity of its nutritional value. A little sleuthing lead me to this amazing discovery: raw cacao has over 300 nutrients. The cancer fighting benefits of antioxidants and flavoniods are accompanied by iron, magnesium and a host of other health boosting nutrients. It even has a healthy dose of tryptophan. Tryptophan, as you may recall from Thanksgiving celebrations, is a natural chemical that is present in warm milk, turkey, and raw cacao that helps induce sleep. Bonus: it helps alleviate symptoms of depression. 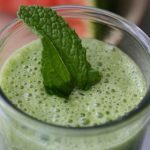 My Raw Chocolate Peppermint Smoothie blends together two healthy ingredients for a festive raw green smoothie that does a body good. For a velvety texture, I like to add half of an avocado. 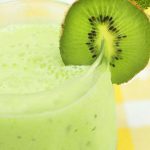 If you’ve checked out my archives of green smoothie recipes, you’ll find that I tend to frequently use half of an avocado for its health benefits and and giving the smoothie a velvety texture. For this recipe, I like to add beets more for the festive red color they impart than the beet’s nutrients. Using raw milk gives more of a creaminess associated with eggnog, but sometimes I replace it with water for a more refreshing smoothie. Cube and freeze beet in advance for a frozen smoothie. Alternatively, use fresh chopped beet and a handful of ice. Gently break apart peppermint leaves. 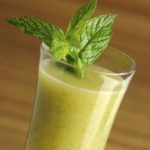 Do this over the blender so the mint oil that is release flavors the smoothie. Add avocado, beet, peppermint, cacao powder and milk or water to blender. Mix for two to three minutes until desired consistency.